Shipping containers are seen at a port in Tokyo, Japan. TOKYO - Booming shipments of cars and electronics in August drove up Japan’s exports at the fastest pace in nearly four years, further evidence that overseas demand is strong enough to support healthy economic growth. 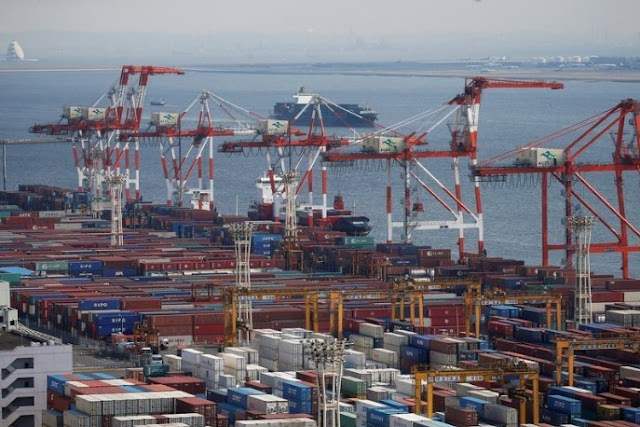 The 18.1 percent annual increase in exports was the fastest since November 2013 and handily beat the median estimate for a 14.7 percent annual rise seen in a Reuters poll. August’s export result was well up on July’s 13.4 percent, and marked a ninth straight month of expansion. Export growth is seen likely to continue as the global economy remains on a solid footing, which should underpin policymakers’ confidence in Japan’s economic outlook. Japan’s exports rose 10.4 percent by volume in August from a year ago, following a 2.6 percent annual increase in July. A pickup in shipments of cars, car parts, and semiconductor manufacturing equipment increased Japan’s year-on-year exports to the United States in August by 21.8 percent versus an 11.5 percent annual increase in the previous month. China-bound exports rose 25.8 percent year-on-year in August, faster than a 17.6 percent annual increase in July as Japan shipped more electronic screens panels and plastics. Imports rose 15.2 percent in the year to August, versus the median estimate of an 11.8 percent increase. The trade balance came to a surplus of 113.6 billion yen ($1.02 billion), versus the median estimate of a 93.9 billion yen surplus. Booming shipments of cars and electronics in August drove up Japan’s exports at the fastest pace in nearly four years, further evidence that overseas demand is strong enough to support healthy economic growth.